Every little girl has dreams of being swept up into a great adventure, of being the beautiful princess. Sadly, when women grow up, they are often swept up into a life filled merely with duty and demands. Many Christian women are tired and struggling under the weight of the pressure to be a "good servant," a nurturing caregiver, or a capable home manager. What Wild at Heart did for men, Captivating will do for women. By revealing the core desires every woman shares- to be romanced, to play an irreplaceable role in a grand adventure, and to unveil beauty-John and Stasi Eldredge invite women to recover their feminine hearts, created in the image of an intimate and passionate God. Join us as we journey into the deep mysteries of our feminine souls in order to recapture our hearts. Through the help of this Leader's Guide, you will lead your group as you embark together on a great adventure of coming alive as a womanA . . . God's captivating woman. - Publisher Every little girl has dreams of being swept up into a great adventure, of being the beautiful princess. Sadly, when women grow up, they are often swept up into a life filled merely with duty and demands. Many Christian women are tired and struggling under the weight of the pressure to be a "good servant," a nurturing caregiver, or a capable home manager. Join us as we journey into the deep mysteries of our feminine souls in order to recapture our hearts. Through the help of this Leader's Guide, you will lead your group as you embark together on a great adventure of coming alive as a woman?. . . God's captivating woman. 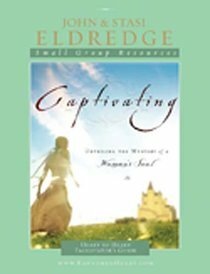 About "Captivating: Heart to Heart (Leader's Guide)"
Every little girl has dreams of being swept up into a great adventure, of being the beautiful princess. Sadly, when women grow up, they are often swept up into a life filled merely with duty and demands. Many Christian women are tired and struggling under the weight of the pressure to be a "good servant," a nurturing caregiver, or a capable home manager.